Amala Citlali finds herself way in over her head (and...her own bodies) on the cover of Self/Made. The last few months of 2018 are creeping up on us, which means that there are an absolute ton of new comics to be looking forward to. Image is adding another intriguing series to your potential read pile: a mysterious fantasy series called Self/Made, and we’ve got a first look. io9 can exclusively reveal Self/Made, a new Image Comic series from writer Mat Groom, artist Eduardo Ferigato, and colorist Marcelo Costa—and edited by outgoing Mighty Morphin Power Rangers writer Kyle Higgins—coming later this year. To learn more about Self/Made—and get a tantalizing preview from the first issue—check out our interview with Groom and Ferigato below. io9: Tell me a little bit about how this project first came together. Where did Self/Made start? Mat Groom: Well, (Self/Made editor) Kyle Higgins and I have been friends for a few years, and we talk story constantly. He was familiar with a few of my smaller projects, and asked if I had ever considered doing an ongoing series. I told him I would absolutely love to, and I very quickly wrote the script for what is now the first issue of Self/Made—though I think at first it was called “Heir Presumptive”? Which is an absolutely terrible name, so I’m very relieved we came up with something better. After that, Kyle told me he’d like to take it on as his first editorial project, and he sent me some portfolio work of artists he was familiar with...and I just completely fell in love with Eduardo’s work. Eduardo and I had quite a few Australia-to-Brazil Skype chats to help flesh out the world for the rest of the series—this came very easily, because we got along like a house on fire; it turns out we have very similar tastes and interests. And then we were off to the races! Eduardo Ferigato: Yeah, Kyle put Mat and I together, and he started by sending me the script for the first issue. As soon as I had finished reading it, I was crazy-excited to start drawing. The story and the universe that Mat created, I fell in love with it. So together, along with Marcelo Costa (who is the incredible colorist on our series), we produced a pitch for Image, and they agreed to publish our story! We couldn’t believe it when Kyle told us the news. The full cover for Self/Made’s first issue. io9: What can you tell me about the design process for Amala, and how did she come to be the focal character of the series? Groom: Honestly, I hate to be that guy, but…Amala came pretty much fully-formed, at least as far as the scripting went. I knew I wanted to tell a story about searching for purpose when you feel you have your whole life dictated for you. So that meant a protagonist who is wholly dedicated to her role, enough to have stuck with it for her entire life, but also someone with a lot of internalized aspirations, and the determination to chase those aspirations when the opportunity arises. From there, working with Eduardo to develop visually…that actually helped to crystalize Amala’s characterization further. Ferigato: While some of the characters in Self/Made wear big, hulking, metal armor, we wanted to give Amala (and the other members of her people) something simple, humble, and light. This helped us convey the sort of life these people live—they’re not big on ego or presentation, because they’re all focused on the simple-but-important task of protecting the kingdom. It also informed her fighting style. Amala can’t rely on armor to protect her, so she has to be fast, confident, and adaptive. In many ways, Amala speaks more through her actions (particularly when she’s fighting) than she does through words. 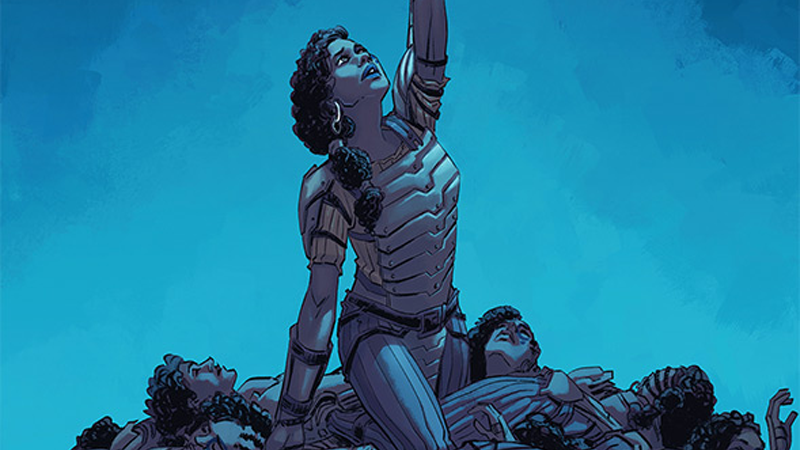 io9: This is a series that plays with a lot of fantastical tropes—maybe this is more particularly for Eduardo, but what aesthetics inspired you for Amala’s home kingdom as we see it in this first issue? Ferigato: There’s a bit of Lord of the Rings, a bit of Game of Thrones, a bit of For Honor, which I was playing a lot when I was first developing the series...but I drew upon pretty much all of the fantasy movies and games that I’ve watched or played in my life, in one way or another. But as we move past issue one, we’ll be going to very different places…so we’ll be exploring many different aesthetics. It´s a huge universe that we are creating here, which has been a big challenge for me as an artist. Every issue demands a lot of research. But I can´t get into details yet, or Mathew will kill me! io9: Speaking of the book’s aesthetic, the teaser trailer hints that as Amala comes closer to encountering her gods, you’ll be introducing some more sci-fi design ethos. What drew you to marrying together science fiction and fantasy like this in the first place? Can readers expect more of a focus on the fantasy nature, or those sci-fi underpinnings? Groom: As much as Self/Made is a deeply personal, intimate story about the relationship between God and creation, the framing of that lends itself to exploring—actually almost demands that you explore—the breadth of all creation. So…we’re going to do that! Obviously there’s a lot of fantasy-inspired visuals here, and as you identified we’ll be hitting some sci-fi inspired worlds very soon…and after that, we’re headed for what I guess I’d call “non-traditional” fantasy. So we’ll be all over the sci-fi/fantasy spectrum. I mean, c’mon—look at Eduardo and Marcelo’s work, and just try and tell me you don’t want to see them render literally anything you can imagine. io9: [Image is] citing Westworld as a key inspiration on the series—which brings with it connotations of the “mystery box” style of storytelling. Is this a series where you want readers to always be questioning what they’re seeing from the get-go? Groom: If I can peel back the curtain a bit here, both Kyle and the good folks at Image have been using Westworld as a good reference point (and I’m sure it is! ), but to be perfectly honest I still haven’t gotten around to Westworld yet, so I can’t speak to that in particular myself. In terms of mystery box-style storytelling, absolutely. It’s important to us to surprise readers, to make sure they feel like there’s always more to discover. But I think you can fall into a bit of a trap, as a creator, in crafting surprises for the sake of surprises, and questions without answers. We’re determined to provide answers almost as quickly as we provided questions, and to make sure surprises are in service of character. io9: There’s a lot of interesting storytelling moments in this issue, like the one we’re getting to show off here, with the party’s encounters with the Skrellian elders. Is that a storytelling trick you want to keep playing with—the idea of seeing scenes play out multiple times—going forward? Groom: You’ll see a bit more of that towards the end of issue one, and you’ll also find out why that’s happening—but after that, no. I suspect readers would get a bit tired of that trick, and Eduardo would come to resent having to revisit scenes constantly. Having said that, I think it’d be fair to say that I’m quite fond of experimental storytelling techniques, so you certainly shouldn’t expect everything to play out simply and linearly from here on out. io9: As I mentioned before, another big theme in the book is Amala getting to come face to face with her creators during her quest. What can you tell us about how this encounter challenges her? Groom: In a lot of ways, Amala is a straightforward character. She knows what she wants, and she does what she needs to do to get it. But that means when she becomes aware of divine forces, when she realizes there’s a higher authority dictating her position in the world…it shakes her to her core. Her agency is fundamental to her identity, and when that’s brought into question, everything unravels. And I think that’s very relatable—because we all have to grapple with that, at some point in our lives. We all want to have a “purpose,” but we also want to be masters of our own destiny, and those two desires are inherently contradictory. And because it’s comics, those contradictions will be expressed using dragons and Ghost Kings and shoot-outs. io9: Finally, It’s safe to say that there’s a bit more going on in Self/Made than it seems at first. What do you hope people will take from this first issue? Groom: I hope that the primary takeaway is that we’re looking to pack a whole lot into each and every issue. Each one is obviously a part of the grander narrative, but every issue tells a story. Every issue takes you on a new journey. I think readers deserve that. Self/Made #1 hits shelves this December.